Hello there again! Guess what? 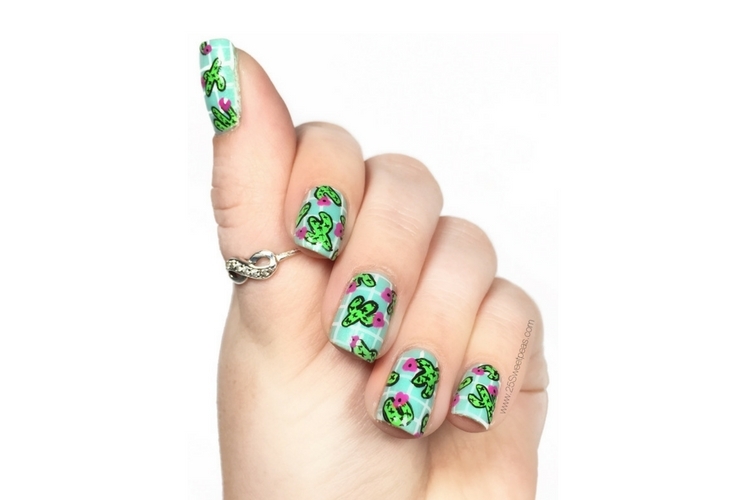 I am back with more cacti nails! Eppp, I know I should of like saved these for a later date but the obsession is real and I just can't help it! So lets take a look at these! First off this mani is inspired by @Glitterfingersss on Instagram! You can see the inspiration here. Mine aren't half as good but they still make me smile with is what matters right! Mainly I think my colors are just off but oh well! I'm still smiling when I see them! The base color is Takko Lacquer Curious and Curiouser. The art was then all done with acrylic paint. Actually funny story. It took me so much longer than it should of to do this mani! Mainly due to music. See I was previewing a new song, and then heard a bit of it that just sounded so familiar, so of course I had to go and try to figure it out. Its funny how I have now gotten to that point where I know so many songs I can pick them out when people reuse little bits. There was a time where I can remember always thinking how can other people do that. Oh and my brothers and I used to always say our parents knew every song on the radio and so on. Now though we are all that way! Guess that happens once you get to 20 almost 21! Ha! So cute! Loving the cactus look! Thank you so so much! Its like my new favorite thing! So cute ...love the base polish. Thank you so much! Its gorgeous! I don't use it nearly enough!